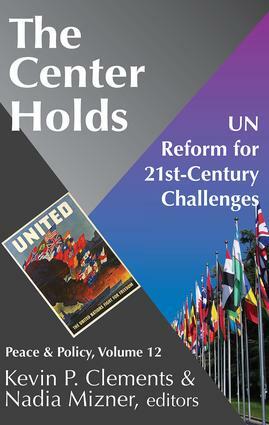 The United Nations remains a unique institutional hope for addressing and resolving the world's major environmental, developmental, and humanitarian problems. It representsglobal aspirations for a just and peaceful world by inspiring the political imagination of individuals and collectivities. But, because it is now viewed primarily as a "trade union" for expressing the national political interests of 192 state parties, as Clements and Mizner's volume of essaysdemonstrate the UN has succumbed to political cynicism and skepticism. Only the UN can champion emerging international regimes, the rule of law, and global processes that generate structural stability, justice, and peace in the international system. Unlike some central security organs of the UN, specialized UN agencies have addressed these problems. With the exception of the wars in Afghanistan and Iraq, the UN and its affiliates have played an important role in ending violent, political conflict and in preventing further conflict. According to the Human Security Report (2005), the 80 percent decline in deadly conflicts since the early 1990s can be explained by the extraordinary upsurge of activity by the international community,which t has been directed towards conflict prevention and peace-making.